One of the quickest meal options is pulao and spiced peas pulao is a classic. This is a very easy recipe to make with basmati rice, green peas and spices. 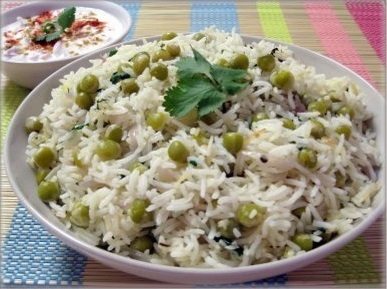 Aromatic & spicy, matar pulao is as much a pleasure for the eyes as for the taste buds. You can use fresh or frozen peas for the dish and serve it with plain yogurt, raita or even green chutney. Wash the rice 4-5 times and soak for half an hour. Take a deep thick bottom pan and keep on medium heat with ghee or oil in it. When it heats up nicely, add in cumin seeds and all whole spices. When the spices start to crackle add peas and garam masala to the pan. Fry for 2 minutes then add 2 cups of water and salt in it. As the water starts boiling add soaked and drained rice in it, stir gently with a spatula to mix all. Let it boil on high heat for 2 minutes, then cover the pan and let it simmer on low heat until the water evaporates and the rice is well cooked. Stir gently in between only once or twice to see how much of the water is left. Do not stir rice much while cooking otherwise it will break the rice grain. Turn off the heat and let the pulao stand for 10 minutes. Remove the lid and mix slowly to combine the spices and peas evenly with the rice. Tip: Put 1 tablespoon ghee on the pulao after removing from heat to enhance the taste. Transfer into serving platter and serve hot with curd, salad and green chutney.